If you know any devoted Tolkien fans, especially who have read and re-read the Hobbit and wish they had something more, this early children’s book by Tolkien might be the perfect book. Apparently, Tolkien crafted several short novellas out of stories that he made up for his own children, and Roverandom is one of them. Published posthumously with the help of Tolkien’s children, both the story as well as the background history of where the story came from, are contained in one small volume. 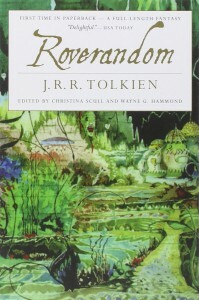 Much of Tolkien’s fantasy style evolved over time, and Roverandom is like glimpsing the early soil for Tolkien’s masterpieces. This early children’s book is not a masterpiece of it’s own, but it is quite a lot of fun to read. Because it is fairly short, it can make a very entertaining and engrossing read-aloud as well, probably for six to eight-year-olds. There are some wonderful literary allusions throughout the book, that are well-explained in the introduction. In some ways, therefore, this children’s book has two audiences: adults will enjoy reading the introduction and the back material, and children, ages 9 and up, will enjoy reading the story itself. How wonderful that material like this is made available to us, rather than being lost to history.